Have your own wooden sigitem or wooden nickel made. 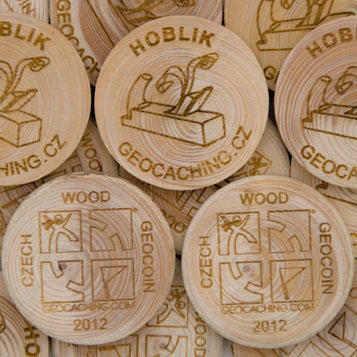 Czech Wood Geocoin is widespread sigitem with long tradition. There are thousands of personal designs of these wooden nickels. We make versions for other countries. These are not trackables, but personal signature items. Wooden coins generally have standard back side with geocaching logo, your country, and year of production. On the front side your geocaching nick, your logo, and country code. We can also make fully personalised variant - with your own design on both sides. Size: diameter 35 mm, thickness 7 mm.